Personalized 5 inch x 2 inch acoustic guitar shape magnet stands perfect for instrument shops, music teachers, bands, concert promoters, musicians, guitar manufacturers, announcements, musicians, etc. It can add music to your campaign with its indulging shape and most people feel pride in retaining such exotic magnets over their work cabinets or refrigerator doors. It is a perfect choice for gifting at the end of a concert, service or sales or during musical events or personal celebrations, etc. 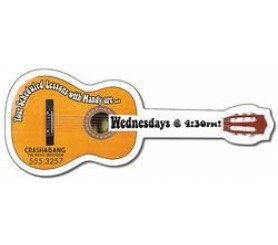 Attractive price savings can be availed on bulk orders of this guitar shaped magnet. Request a quote to know your exact catch on discounts that we offer on bulk orders of custom 5 inch x 2 inch acoustic guitar shape magnet. Product size – 5x2 inch. Product Size: 5 in. x 2 in.